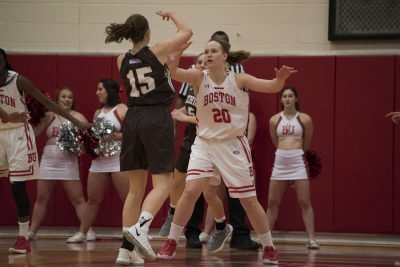 The Boston University women’s basketball team fell to the United States Naval Academy 59-48, and has now lost two matchups in a row after winning two straight. With 27 turnovers against Navy (22-4, 12-3 Patriot League) and 24 against American University, BU (10-15, 5-10 Patriot League) has turned the ball over 51 times in the past eight quarters. BU head coach Katy Steding said she knows with her team’s uptempo offense, some turnovers are expected — but not this many. After turning the ball over eight times in the first quarter in their 61-54 loss to American (22-4, 15-0 Patriot League) Wednesday night, the Terriers started sloppily again against the Midshipmen. BU had seven turnovers in the first five minutes, but still led 7-5 early on. The team would finish the quarter with 11 turnovers, and continued to lead 13-12 after 10 minutes. In the first quarter, sophomore forward Nia Irving had four points and four rebounds while freshman guard Tenisha Pressley had four points as well. Going into the second quarter, the Terriers could not score for the first four minutes, allowing the Midshipmen to take a 18-13 lead. Senior guard Taylor Dunham paced all players and would finish the half with 14 points. 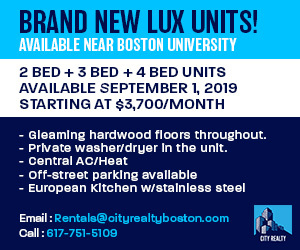 BU tied the game at 25 late in the half when junior guard Payton Hauck connected from downtown. Along with Irving and Pressley, Hauck and senior forward Corrine Williams were the only Terriers to score in the first half. Dunham hit a late three to give Navy a 28-25 lead at halftime. Irving shot 6-for-8 from the field in the first half for BU, which was good for 13 points. No other Terrier had more than five. The first half was filled with turnovers, with BU turning the ball over 17 times to 13 for the Midshipmen. While her team struggled on offense, Steding had high praise for her defense. However, she said she felt they gave up too many offensive rebounds, especially early in the game. The Terriers had a poor offensive showing in the third quarter, scoring only four points in the first 8:57 of the frame. Dunham hit her fifth three-pointer as Navy took over, giving her 17 points for the game. Dunham would not score the rest of the way. Since a layup from freshman guard Katie Nelson 11 seconds into third quarter, BU only scored two points between the layup and the 1:03 mark of the quarter, none of them from the field. Two free throws were the only points for the Terriers in that span until junior forward Naiyah Thompson got a layup with 1:03 to play in the third quarter. BU still only scored six points in the third frame and trailed 40-31 with 10 minutes to play. Irving hit an early three to cut the Midshipmen deficit to six, but Navy responded with a 7-0 run to take a 13-point lead, its largest of the game. BU would cut it to eight with under three minutes to go, but this time it was a 6-0 run for the Midshipmen that put the Terriers out of reach. Irving has scored at least 16 points in the last five games, but her 16 tonight was not enough as Navy won 59-48. Steding said she has been very happy with the play from Irving as of late, and now wants to see some of the other players contribute more.